At Four Points, form follows function, and timeless classics are woven with modern details. Stylish rooms, comfortable beds and productive workspaces are all paired with delicious breakfast and great coffee to start the day right. Please note, purchases from Four Points by Sheraton will track as 'Marriott'. Rewards will not be paid on any expenditure outside of the room rate. (i.e. room service, in-room movies, parking, dry cleaning, etc). Rewards may not be paid if a coupon code is used that is not listed on this site. Rewards may not be available until 90 days after the completion of travel. Rewards may not be paid on group, member or partner rates, promotional discount rates or travel agency rates. 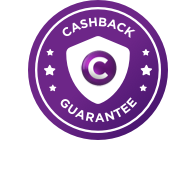 You won’t earn Cashback if you cancel, change or return your order. Rewards may take 7 days to be credited to your account. You will receive an email to advise your rewards are pending and awaiting confirmation.